Later me and my wife, Rhi, visted the Old Sneed Park Nature Reserve (not far from the Downs). Nice mixed woodland here; oak (three species), ash, lime, hazel, horse chestnut, sweet chestnut, fir, hawthorn and yew to name but a few. 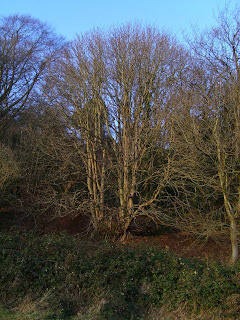 Rhi and I particularly appreciated this pair of smooth barked horse-chestnuts (probably Aesculus hippocastanum), which form one canopy and were highlighted by the sinking sun.